Pitches included everything from a 3D printed communications interface systems to a Revelstoke-inspired triathlon. 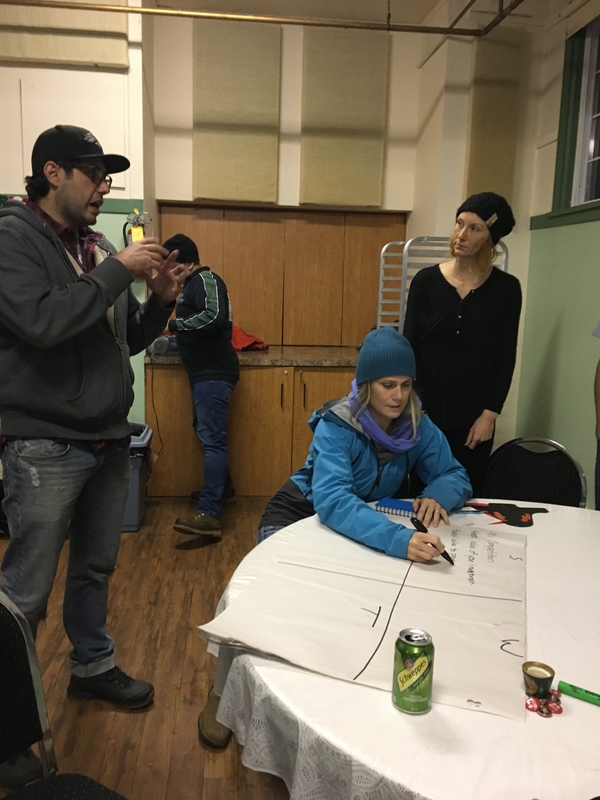 A few attendees of the recent Innovation Night: Sports, Recreation and Adventure Tech spend time discussing Meghan Tabor's idea for a Revelstoke-inspired triathlon. Photo: Melissa Jameson/Revelstoke Mountaineer. Pitching an idea can be a scary experience. 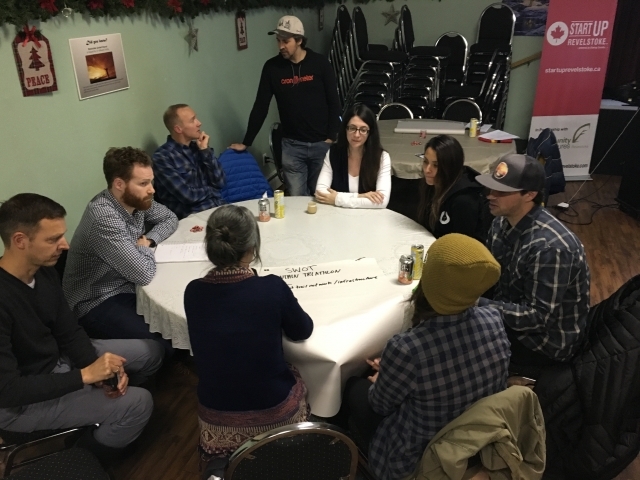 Startup Revelstoke’s innovation nights provide a safe space to connect with other entrepreneurs in a hackathon-type environment. Startup Revelstoke’s recent innovation night on Thursday, Nov. 22 focused on ideas in sport, recreation and adventure technology. The five pitches made included: 3D printed communications interface systems, protective covering to maintain the quality of mountain bikes, the possibilities for electric snowmobiles, a Revelstoke-inspired triathlon and an outdoor activity brand focusing on providing great photos so you can stay focused on enjoying your adventure. After pitching their ideas, entrepreneurs had a chance to sit with other attendees and work together on completing a swot analysis. A swot analysis is an opportunity to go through possible strengths, weaknesses, opportunities and threats related to an idea. Selim Sabbagh discusses his idea to create a protective adhesive to maintain the value of bikes. Photo: Melissa Jameson/Revelstoke Mountaineer. Alex Baechler – 3D printed communications interface accessories. Outdoor Logistics executive director Alex Baechlor spends his days focusing on helicopter logistics. He knows the importance of effective communication and the need to communicate both with the helicopter pilot and the ground crew. Baechler and his team are working to create a communication interface that allows a seamless connection with both helicopter and ground radios. He also knows guides have a preference for the type of helmet they wear. His solution? He’s hoping to bring 3D scanning into the equation to bring his idea to a larger audience by creating personal protection mounts that can fit on any helmet. Great bikes don’t come cheap, but unfortunately due to normal wear and tear they depreciate in value pretty quickly. Tantrum Ride Co.’s bike guru Selim Sabbagh has an idea to help fix that. He wants to create a protective adhesive that can cover the bikes, helping to maintain their value by ensuring they’ll still look brand new a few years down the road. Triathlons usually have a standard set of events — run, bike, swim. 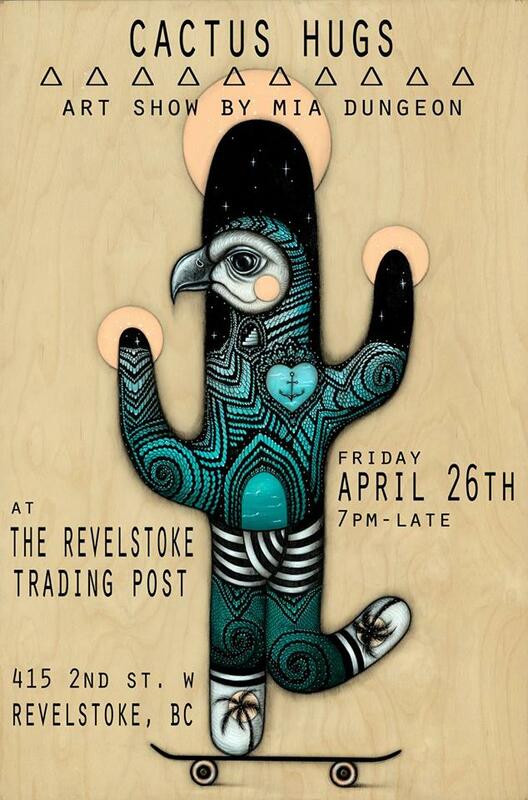 Meghan Tabor wants to take that and give it a Revelstoke twist. Her idea? Instead of the traditional bike, run, swim the Revelstoke triathlon would consist of a stand-up paddleboard portion, a trail run and a mountain bike ride. Tabor’s idea doesn’t necessarily include the use of technology, but not all ideas pitched during innovation nights need to have a technological component to them. It can sometimes be a little difficult to enjoy your adventure while simultaneously trying to take great photos for your social media pages. Amber Lane is hoping to help you out with that. Her idea? Create an outdoor activity brand that not only provides great guided adventures, but leaves you with top quality photos you don’t have to take yourself. Adventure guides would be trained to take awesome photos which could be shared on various social media platforms. It’s no secret Infinite Powersports owner Kert Broza is a big fan of machines that go braaaaaapppp!!! Electric sleds are a fairly new innovation and have a long way to go before they’ll be able to compete with their gas-powered counterparts, but Broza says he’s also aware of the environmental implications for electric sleds. While not necessarily a true pitch, a number of attendees at the innovation night spent time discussing the pros and cons of electric sleds and the improvements needed before they can compete with their gas-powered counterparts. Innovation nights provide a starting point for entrepreneurs to work on their ideas. So what’s next? That’s up to individuals pitching their ideas. 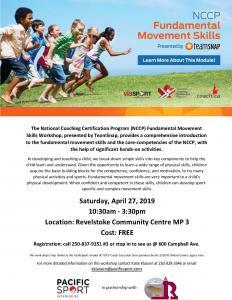 Who knows, maybe you’ll be hearing more about a Revelstoke-inspired triathlon or signing up for an adventure where you can leave your camera at home.